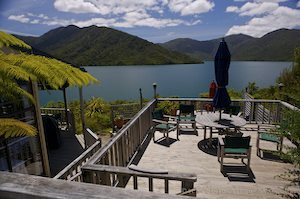 Resorts in the remote Endeavour Inlet of the Queen Charlotte Sound and Camping farm style in Titirangi Bay, New Zealand. This day dawns bright and sunny - yay!! So we leave our oceanfront property (campsite) overlooking Double Bay with boats anchored a few metres out, bobbing gently on the tide. We retrace our tracks a little back to the Kenepuru Head, following the coastline as it ducks in and out of various bays along the way. Once back at the turn off to Kenepuru Head, we turn left onto Titirangi Road which leads to the Sounds retreat destination of Punga Cove Resort. We take a park at the top carpark and wander down the steep driveway to the resort. Along the path in the resort, is a collection of chalets separated by native bush but with views of the pristine Endeavour Inlet. The swimming pool looks inviting and is surrounded by deck chairs. We grab a coffee at the Boatshed Cafe which is located at the beginning of the pier and enjoy the stupendous view at sea level. While walking back along the path we take a peek at the shop and begin talking with the owners and hosts of Punga Cove Resort Ralph and Beverley Faulkner. We are offered to be taken out to their other property, Furneaux Lodge which is situated in the other arm of Endeavour Inlet and nestled at the foot of Mount Furneaux. This 1000 acre property is surrounded by forests and fringed by the waters of the Queen Charlotte Sound - only accessible by water taxi (1.5 hr) or helicopter (15 mins). The main building was built in the early 1900's and has been tastefully refurbished in keeping with the era the building was constructed, and there are new chalets available nearby. Here is a paradise for sure - you can either relax and do sweet nothing, or experience walking, kayaking, and fishing from either of these two wonderful resorts. Check out their websites - Punga Cove Resort and Furneaux Lodge. Onwards and upwards for us ... we head back out onto the gravel topped Titirangi Road and continue our ascent towards Mt Stokes with a few viewpoints along the way overlooking Endeavour Inlet. From here the road continues to wind and twist until we finally come to a point overlooking Titirangi Bay on one side and Port Gore on the other. Our destination tonight is Titirangi Bay and looking from the top - this is definitely a slice of heaven!! We make our way to the basic camping ground which is a paddock full of large healthy sheep. Our first mission is to get down to the beach and explore! Second mission was to get back to the top of the road for a sunset shot. We settled back into the camp site after sunset and enjoyed a little R&R while listening to the occasional baaaahhh of our new neighbours - the sheep.